A colourful Asian-inspired dish perfect for the whole family. Heat oil in a large fry pan and sauté the garlic and ginger over a medium heat for five minutes until soft. Add mince and stir-fry until cooked. Then add vegetables and stir-fry for approximately five minutes. Finally add rice and soy sauce and toss to coat. Stir-fry for approximately 2-5 minutes until all ingredients are hot. Serve on to plates and top with spring onion and bean sprouts. For a vegetarian option, use tofu instead of chicken or pork mince. If you’re after a gluten free option, use tamari instead of soy sauce. 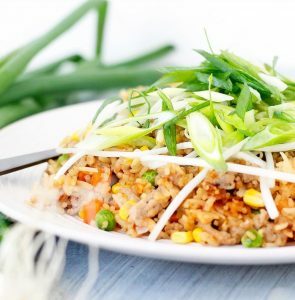 For the rice in this recipe, use cooked and cooled rice, or day old cooked rice, as freshly cooked rice will make your fried rice gluggy.